Worship leader Barbara opened the service Sunday with the observation that it had been a full week…we mourned the unexpected death of a long-time member, we celebrated the birth of a baby girl into the lives of a couple among us, and we marveled at our own capacity as KRMCers to prepare, sell, and even help purchase approximately 1,800 samosas at the Michiana Mennonite Relief Sale. Since the first event in 1968, proceeds of the Michiana sale, held at the Elkhart County Fairgrounds, have supported the projects and programs of Mennonite Central Committee (MCC), a worldwide relief and service ministry of Anabaptist churches. MCC shares God’s love and compassion for all in the name of Christ by responding to basic human needs and working for peace and justice. Made possible with the help of hundreds of volunteers who contribute time and resources, the Michiana sale is one of 46 relief sale events in the U.S. and Canada that together raise more than $5,000,000 annually, according to the event’s website. Like many other Indiana/Michigan congregations, Kern Road participated in the My Coins Count initiative, which enables children and adults to donate coins during September worship services and education hours for the global water projects of Mennonite Central Committee. Coins collected are delivered for counting to the relief sale, where totals are announced. Kern Road contributed $839.89 via My Coins Count. We took the grandkids to scout out the relief sale Friday night. 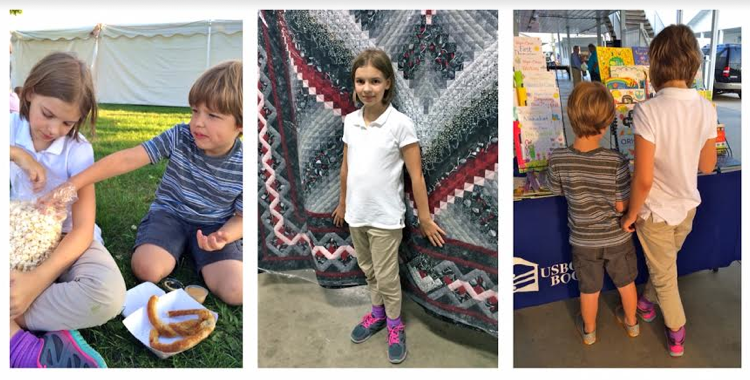 Some of their favorite stops over the years have been the kettle corn table, Ben’s soft pretzels, KRMC’s samosa booth in the big food tent, and the pie and decorated cookie sales in the arena where the quilts are sold on Saturday morning. We also did a cursory inspection of the quilts, made some purchases at the Usborne book shop, watched folks tying comforter knots, and found bargain-priced yarn for our granddaughter’s ever-growing interest in knitting, which she has pledged to put to good use for future MCC relief sales! I continue to become aware of new ways individuals and congregations can help raise funds or participate in creating material resources for donation to people in need around the world through MCC. 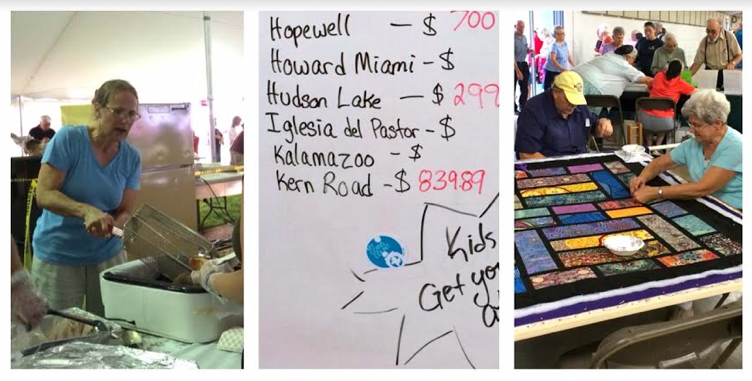 We learned on our trip to the Michiana event about the second annual MCC Great Lakes Comforter Bash scheduled for 9 a.m. to 5 p.m. Friday and Saturday, October 21-22, at Pleasant View Mennonite Church, 58529 County Road 23, Goshen. According to handouts promoting the event, “all ages and skill levels are welcome (women, men, youth groups, friends, and family). A handmade comforter provides not only warmth but also a tangible message to people that their needs are not forgotten.” Donations of comforter tops and backs (twin size preferred), batting, and knotting thread and supplies are welcome. Find more information here. When needs created by all that’s going on in our world today stretch far beyond the assistance we might provide as individuals, MCC offers options by which we can collectively create a dent in that overwhelming chasm. I am thankful that MCC opportunities combine our separate efforts into useful ways of offering care to a world in need. How might you pitch in to support far-flung efforts through organizations like MCC? Alternatively, plenty of opportunities exist on the home front as well to make a difference in the lives of others. Consider finding a way to contribute in these ways this week.